Abbo is 8-1 on the morning line. Photo by Jim McCue, Maryland Jockey Club. Having won the $100,000 Maryland Juvenile Filly Championship last December with another daughter of Freedom Child, trainer John Salzman Jr. will be looking to make it two in a row with streaking filly Sip of Sunshine. Owned by Salzman’s wife, Marla, Sip of Sunshine will be making her stakes debut in the Juvenile Filly Championship off three consecutive wins by six combined lengths, all at Laurel, going both 5 ½ and six furlongs. She finished fifth in her first two races before running second in a four-furlong maiden claimer Aug. 31 at Timonium that preceded her streak. 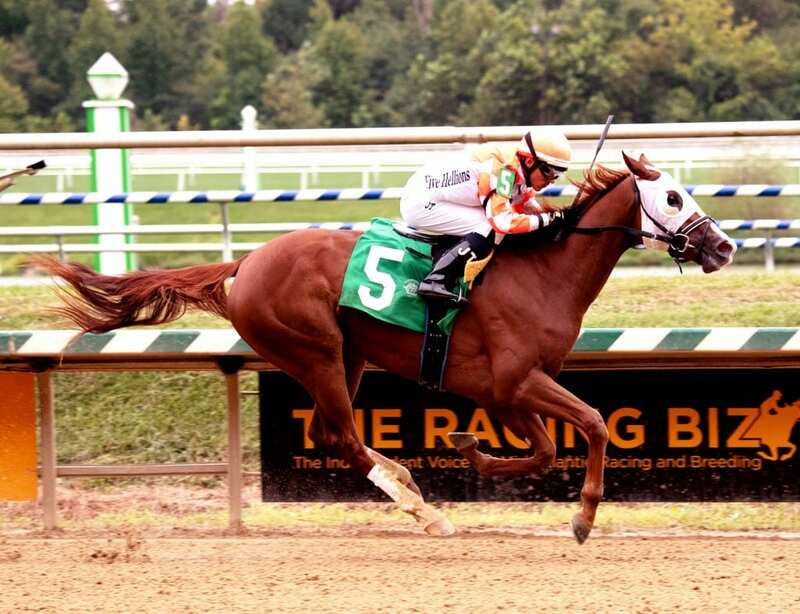 Limited View won last year’s race for Salzman, clinching Maryland-bred champion 2-year-old filly honors. Salzman feels Sip of Sunshine could be on a similar track, despite more humble beginnings. Consigned to Fasig-Tipton’s Midlantic Winter Mixed Sale in January 2017, she failed to meet her $1,000 reserve. Trainer Cal Lynch will send out Belial, a daughter of Tritap he co-owns with Norah B Stable. Also with seven starts behind her, Belial has finished first or second in her last four including a seven-furlong optional claiming allowance win Nov. 17 that followed a runner-up finish to My Star Potential in the Maryland Million Lassie. Make Family First Stable’s Money Fromheaven will test stakes waters for the first time, coming off a 1 ¼-length waiver maiden claiming triumph moved from the grass to the main track at one mile. Each of her last four races have come off the turf, and she has finished worse than third just twice in seven starts. Rounding out the field are Abbo, Like a Pro, Nine Martinis, No Mo Lady, Past Perfect, Questionoftheday Waiting for a Star.